Data from a recent NAHB survey show that bedrooms account for 28.0 percent of the finished floor space (11.3 percent for the master bedroom, 17.3 percent for all other bedrooms) in the average new home. Other spaces accounting for significant shares include the kitchen (11.2 percent) and family area (10.1 percent). More of the percentage breakdown is shown in Figure 1. The percentages are based on responses to special questions on the NAHB/Wells Fargo Housing Market Index survey for November of 2018. The questions covered 13 specific types of areas or rooms, plus a catch-all “other” category for any types not on the list, and asked builders to estimate the percentage of the total square footage of their typical home devoted to each area. A total of 153 single-family builders provided complete and internally consistent responses that could be used to calculate averages. The average size of the homes was about 2,913 square feet of finished floor spaced—larger than the 2,631 square feet in average single-family homes completed in 2017 (which includes a percentage of single-family townhomes). Hence, the percentages discussed above mean that builders allocate an average of 815 square feet of space to bedrooms (312 of which is for a master bedroom), 326 square feet to a kitchen area, and 295 square feet to a family room or area in the typical new home. 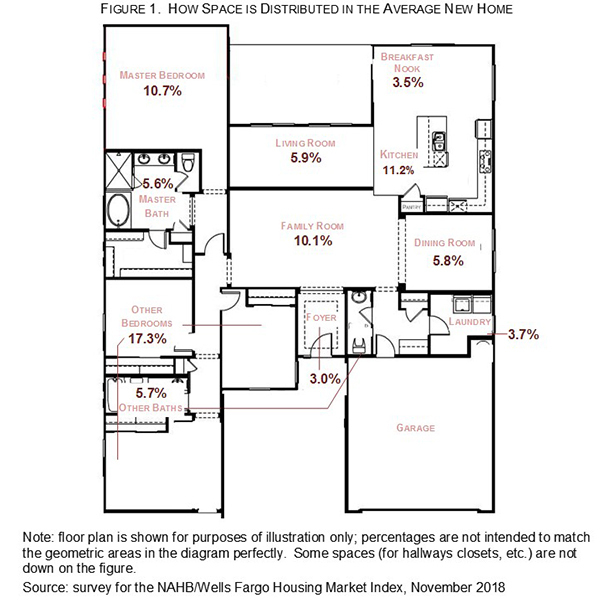 Also on average, 332 square feet (11.4 percent) is allocated to “other” finished space (Table 1). When asked what gets included in “other,” builders most often said hallways, followed by a wide variety of variously described extra rooms. In answer to a separate question, builders reported that their typical new homes contained an average of 79 square feet of closet space. About half of the time, they also included closet space in the size estimates they provided for other areas of the home. In addition to an average breakdown of space across all new homes, Table 1 also shows average breakdowns for small (with under 2,000 square feet) and large (with at least 3,500 square feet) new homes. As the table shows, the master bedroom accounts for a larger share of the space in small new homes than in large ones (13.1 vs. 9.2 percent, on average). Other bedrooms (those not part of a master suite), however, account for roughly 17 percent of the finished floor space in both large and small new homes. Bathrooms in aggregate account for between 11 and 12 percent of the finished floor space in both the large and small new homes. In the large homes, however, a smaller share is allocated to the master bath (5.2 percent, compared to 6.5 percent for the small homes), and more to other baths (6.6 vs. 4.9 percent). This is not surprising, given that larger homes may have more baths as well as larger ones. The share of space allocated to many of the areas listed in the survey, varies only slightly with overall home size. The dining area, for example, accounts for close to 6 percent of the finished floor space in both large and small new homes. The greatest percentage-point gap appears in the living room or area, which accounts for 10.0 percent of the space in the small new homes compared to only 4.4 percent in the large ones. 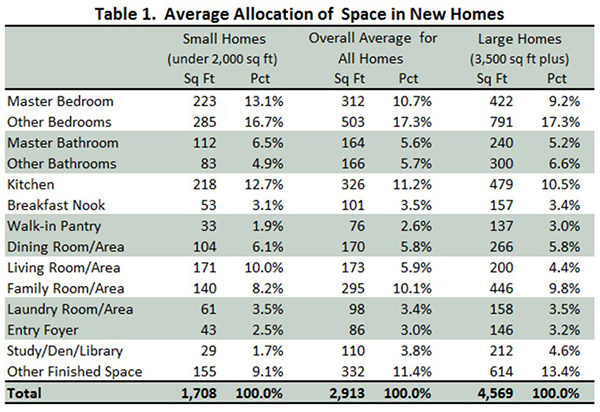 Table 1 shows the average allocation of space across all homes, whether or not the homes contain a particular type of space. If a home lacks a study/den/library, for example, that home is included in the average where it is counted as having zero square feet in a study/den/library area. Some readers may also be interested on how often builders provide specific types of rooms and how big the rooms are, when they are provided. Table 2 shows the incidence of particular rooms and the size of these rooms when they exist. 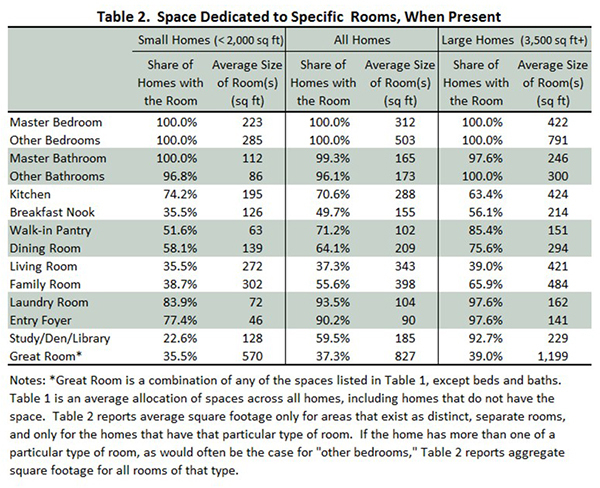 Table 2 reports average incidence and space allocated only for the areas that constitute distinct rooms (separated from other areas in the home by walls). Areas not separated from each other are added together and shown as a separate “great” room. Again, results for large and small new homes are shown in addition to overall averages. The only types of rooms present in 100 percent of the builders’ typical new homes are master bedrooms and other bedrooms. Although all the new homes also have at least one bathroom, in rare cases the home has only something the builder classifies as a master bath, or only baths that are not part of a master suite. Every new home also contains a kitchen area, but it is common for this area to be open to other parts of the home, so only 70.6 percent of the homes have a kitchen the builder reports as a distinct, separate room. The only other rooms present in over 90 percent of the homes are the laundry room and the entry foyer. A laundry room is also the home feature most often rated essential by recent and prospective buyers in NAHB’s recent publication What Home Buyers Really Want, 2019 Edition. Not surprisingly, builders tend to provide most types of rooms more often in larger homes. The most extreme example is the study/den/library, which is present in 92.7 percent of new homes with at least 3,500 square feet of finished space, compared to only 22.6 percent of homes with less than 2,000 square feet. The only significant tendency in the opposite direction is the kitchen, which is present as a completely separate room in 63.4 percent of large new homes compared to 74.2 percent of small ones. Again, when not counted as a room, a kitchen area is nevertheless present but counted as part of a great room. Befitting its name, the great room tends to be the largest of the rooms, averaging over 800 square feet across all new homes in the sample. Excluding the space allocated to other (i.e., non-master) bedrooms (which is often spread across more than one room), the second largest room is the family room, which when present averages just under 400 square feet. It shouldn’t come as a surprise that, in all cases, the average room size is greater in larger new homes. Compared to their counterparts in the small new homes (those with under 2,500 square feet of finished space), entry foyers, walk-in pantries, laundry rooms, kitchens, dining rooms, and great rooms are each over twice as large on average in new homes with at least 3,500 square feet. The difference is more than three-to-one in the average size of entry foyers, which is 141 square feet in large new homes vs. 46 square feet in small ones. Historically, a space designed for a specific purpose was called a room, and it was generally understood that this meant an area separated from others in the home by complete walls, except for normal size doors and doorways. But this definition is not always applicable now, as open designs have proliferated and spaces in homes are now routinely separated either not at all, or by various combinations of partial walls, counters, arches, cabinets, bookcases, columns etc. For that reason, the NAHB survey first asked builders about how space was allocated to various areas of the home, then considered whether or not any of these areas were combined into a larger room. A fashionable term for such combined-use spaces is great room, but this is not a consistently well-defined concept. Sometimes the term great is reserved for a room with a very specific combination of uses, or for a large room with a high ceiling. Table 2 takes a broad and generally applicable approach, using “great” for rooms that combine any of the areas (other than beds and baths) listed in the survey. 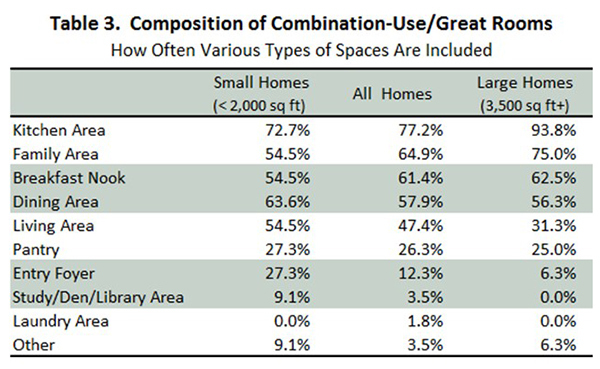 Table 3 shows how often these combined-use rooms contain the different categories of spaces. As the table shows, every possible category was reported as being included in the typical great room by some builder, although only a very small share of the new-home great rooms (1.8 percent) included a laundry area. The most common type of space included was the kitchen area (present in 77.2 percent of the combined-use rooms), followed by a family area (64.9 percent), breakfast nook (61.4 percent) and dining area (57.9 percent). Kitchen and family areas are found particularly often in the great rooms of larger new homes. In the NAHB survey, 93.8 percent of the combined-use rooms of homes with at least 3,500 spare feet included a kitchen area, and 75.0 percent included a family area—compared to 72.7 and 54.5 percent, respectively, in the great rooms of homes with less than 2,500 square feet. In contrast, entry foyers are included in only 6.3 percent of combined-use rooms in the large new homes, compared to 27.3 percent in the small ones. Similarly, living areas are included in 31.3 percent of combined-use rooms in the large homes, compared to a considerably greater 54.5 percent in the small ones. A previous article provided detail on how areas are separated from each other in new homes, and compared it to how home buyers say they want the areas separated. The information on how buyers want the areas separated was updated very recently in What Home Buyers Really Want, 2019 Edition. A copy of the questionnaire is available in the “Additional Resources” box that appears at the top of the online version of this article. Table 1 is constructed by computing first the square footage of type of space, then the average square footage for each type, then summing these average sizes, and finally constructing a percentage distribution based on these results. This ensures that both the square footages and percentages in the table sum to the bottom-line totals. The cut-offs at 2,000 and 3,500 square feet were chosen based on the lower and upper quartiles of the distribution of home sizes in the survey.